The Somerville Winter Farmer’s Market is where I’ve been spending my Saturday mornings. From 9:30am until 2pm, you can find all the freshest vegetables while also supporting local farmers. Plus, there’s milk from Shaw Farm, cheese, bread, meats, cider, and fish. Along with my usual haul of vegetables, last week I decided to get some local fresh haddock from Globe Fish. I’m not really that good at cooking fish at home, so I googled a few recipes and came up with something simple, but promising. 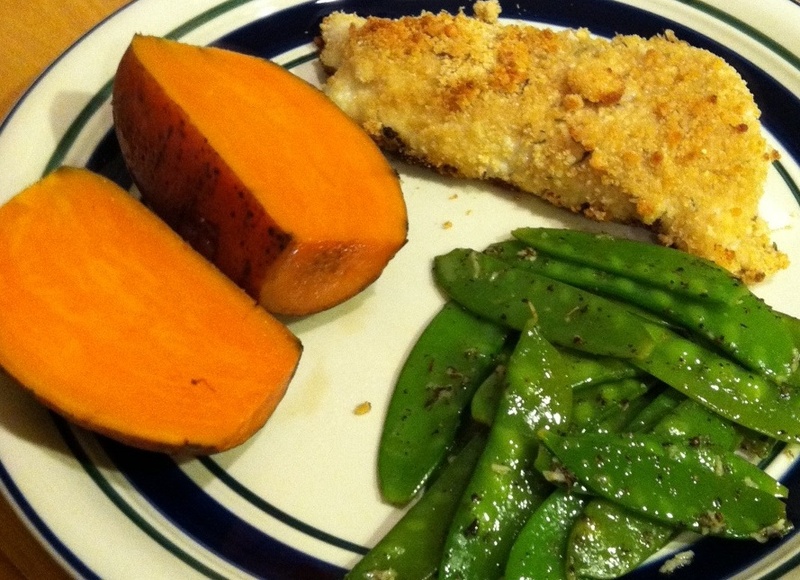 I decided on baking the haddock and serving it with baked sweet potatoes and some steamed snow peas. Start by poking holes in the sweet potatoes, wrapping them in aluminum foil, and popping them into a 350 degree oven for an hour. Sit back and read a book or watch an episode of House Hunters because the rest is so easy that you don’t have to start it until the potatoes are nearly done. In a small bowl, combine the milk and salt. In another bowl, mix together the bread crumbs, Parmesan cheese, and thyme. Make an assembly line where you dip the haddock fillets in the milk/salt mixture, then drop into the crumb mixture and coat evenly, then put the filets in a baking dish. I wanted to make sure they were good and breaded, so I took any breadcrumbs that hadn’t landed on the fish and poured them on top of the filets. (This could be directly related to later setting off the smoke alarm). Top the fish with pats of butter. Bake in a 500 degree oven. I know, I know. It’s crazy. I never turn up the oven that high. But it works, so I did it. Bake for 15 minutes. By now the sweet potatoes should be done, so take them out of the oven when you put the fish in, but leave them in the foil so they stay warm. 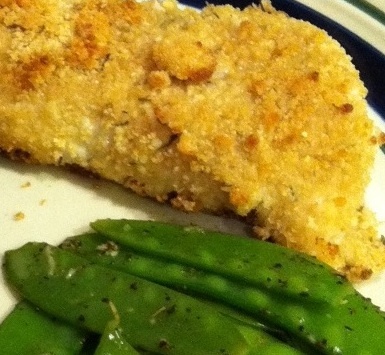 On the stove top, steam a cup or so of snow peas until crisp-tender. In a frying pan, melt 1 Tbsp of butter and add juice from 1/2 lemon, and a bit of pepper and thyme. When the snow peas are done, toss them in the butter mixture to coat. Remove from heat.